A dental emergency, unfortunately, can happen at any time. We provide care for emergency cases at QVC Dental Port Kennedy six days a week and feature an after-hours telephone line. If you’re experiencing a dental emergency, call us as quickly as you can so that we can schedule you for an appointment. Same-day visits are available, and we can advise you over the phone on what action you can take meanwhile. Here, you can find further guidance if you’re currently having a dental emergency. A throbbing, persistent pain disrupts your sleep and makes it feel impossible to concentrate. 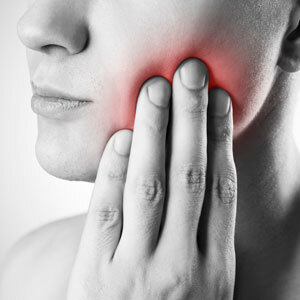 Swelling, fever and sensitivity to cold, heat and pressure are also signs that you might have an abscess. Rinsing your mouth out with lukewarm salt water will provide temporary relief, and cold compresses placed on your cheeks can reduce the pain until your appointment with us. An accident or trauma that knocks out a tooth doesn’t mean it can’t be put back into place. Within a half-hour of the loss, it can be returned to the socket. Handle the tooth at the crown, not the root, and put it in a cup of milk or cover it with gauze or plastic wrap on your way to our clinic. Teeth that are chipped or cracked don’t always mean pain but still require immediate attention. If you can sleep with or without a pain medication, you can wait up to a week before seeking help. If your pain level grows, however, we recommend you make an appointment within 24 hours. A cold compress placed near the site of the injured tooth on your face can alleviate some of the discomfort until your visits. The wires, brackets or trays involved in braces and retainers may cause some pain. If you wear braces, contact your orthodontist straightaway. Sterile gauze can be placed to cover a wire, or soft wax can be applied. If an appliance has loosened, we can temporarily cement it back into place. If you’re bleeding from biting your lip or tongue, direct pressure with a clean cloth will usually stop it. It not, see us immediately or go to the hospital. Dental emergencies in Port Kennedy can reach us by phone or email. Get started! We accept all health fund coverage.